If you&apos;re looking for one of the best views of Chicago, a visit to 360 CHICAGO is a must. In fact, Travel + Leisure magazine named it one of the Best Views in America. 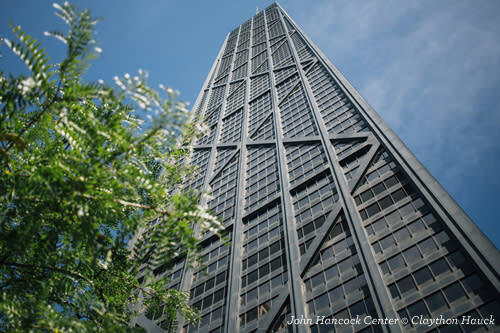 Located high above The Magnificent Mile, 360 CHICAGO is an observation deck nestled on the 94th floor of 875 N. Michigan (formerly the John Hancock Center). 875 N. Michigan is the fourth-tallest building in the city, and is recognized for the distinctive X-shaped external bracing that has made it a Chicago architectural icon. The fun actually begins when you step into the elevators that whisk you up to 360 CHICAGO, reaching top speeds of 20.5 mph during the 39-second ride. 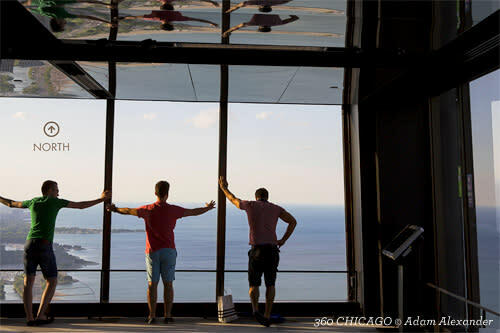 From there you&apos;ll step out onto the observation deck, where you&apos;ll be awestruck by the floor-to-ceiling, 360-degree views of the city, Lake Michigan and up to four states. A good way to get your bearings is to check out one of the interactive touch screens that offer high-definition panoramic views of the city and include information on Chicago history, architecture, and culture (in seven different languages). 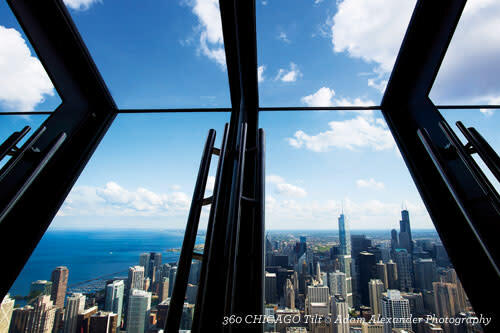 The highlight of a visit to 360 CHICAGO is Tilt, the first observatory attraction of its kind in the world. Think of it as a huge steel-and-glass bay window that tilts forward, stopping at intervals of 15, 25 and 30 degrees, giving you a downward facing view of the city from 1,000 feet up in the sky. Tilt holds up to eight visitors at a time, standing in place and holding onto bars as they are hydraulically tilted forward. The entire breathtaking experience lasts 1 minute and 15 seconds. Afterward, grab a bite or a cocktail at 360 CHICAGO&apos;s Architect&apos;s Corner - Café & Bar. Snack on a gourmet grilled cheese sandwich or a scoop of creamy gelato. The cocktail menu includes fun Chicago-themed drinks, including The TILT: a yummy concoction of Malibu coconut rum, SKYY vodka, lemonade, and cranberry. On Thursday evenings catch Music in the Sky, when DJs spin tunes from 6-9pm. Just sit back and drink in the amazing view as Chicago transforms from sunny day to glittering night. Before you leave be sure to make a stop at the gift shop (there&apos;s one on the observation deck and a second on the concourse level of t875 N. Michigan). Here you can pick up 360 CHICAGO souvenirs, along with Chicago-centric children&apos;s books and handy architecture guides. Then start planning your return trip. 360 CHICAGO is open 365 days a year, from 9am-11pm (last entry at 10:30 pm). Save 10% when you buy your tickets online from 360 CHICAGO, or get discount admission by purchasing a Chicago CityPASS or Go Chicago Card.